I'm not a big drinker, or a big fan of fratastic crowds, so when it comes to St. Patty's Day, the thing I most look forward to isn't all the block parties, or the cry for "Carbombs!" at the bar. Call me an old soul (or Debbie McDowner), but I would much rather indulge in a thick slice of warm Irish Soda Bread, inordinately slathered with sweet butter. I may even go nuts and top off my coffee with a little Homemade Irish Cream. Partayyyy. (*Before you start booing me, if you are into downing some pints and rubbing up against a leprechaun or two, don't worry, I've still got you covered. Scroll to the bottom to see the list of festivities going on in SF). OK, back to my wholesome soda bread. 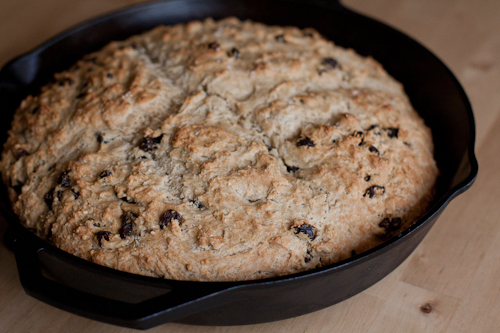 I've learned that the sweet scone-like, raisin-studded soda bread I love so much is very much an Americanized version of the real thing. As Irish chef Rory O'Connell of the Ballymaloe Cookery School in Cork, Ireland reveals in this great soda bread guide in Epicurious, real traditional Irish soda bread is simply basic table bread made with just flour (whole-meal flour for the common loaf, white flour for special occasions), bread soda, buttermilk, and salt. 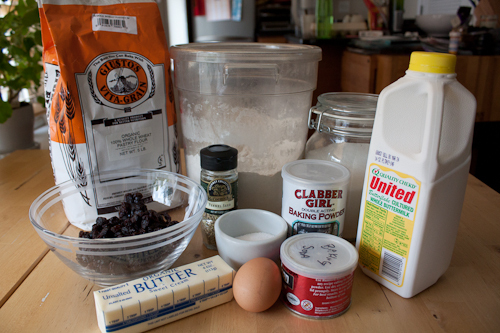 No butter in the dough, raisins only as a luxury, and caraway seeds optional. Makes sense, as this quick bread grew in popularity in the 1800s in Ireland out of necessity. Brown soda bread -- made with soft wheat (the only suitable flour that can grow in Ireland's climate), baking soda (cheap and non-perishable), and buttermilk (accessible by-product of freshly churned butter) -- was an affordable bread that the average household could bake in their own homes without an oven. The formed loaf could simply be baked in a cast iron pot, called a bastible, placed over a fire. The bastible had a lid on it with a curved edge so that you could place hot coals on top as well. I decided embrace my homebody tendencies and do some baking to celebrate this St. Patrick's Day. 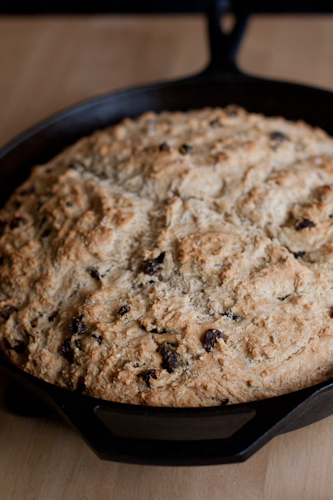 Using this classic Irish-American recipe for Irish Soda Bread with Raisins and Caraway, I got to work. I adjusted the recipe to include half all purpose flour, and half whole wheat pastry flour (which I believe is similar to the soft wheat flour that was originally used in the traditional Irish soda bread). I also cut down the amount of sugar and raisins in it, and substituted the caraway seeds for fennel seeds (since that's what I had on hand, and figured they were a close-enough substitution). If you don't like the licorice-y/anise-y flavor of caraway or fennel, feel free to omit. I only use two tablespoons in my recipe, so the flavor is subtle. I whisked together my dry ingredients first. Then, cut in the butter until the mixture was the consistency of corn meal. Then, I added the buttermilk. The lactic acid in buttermilk reacts with the base of the baking soda to provide the leavening for this quick bread (rather than yeast). 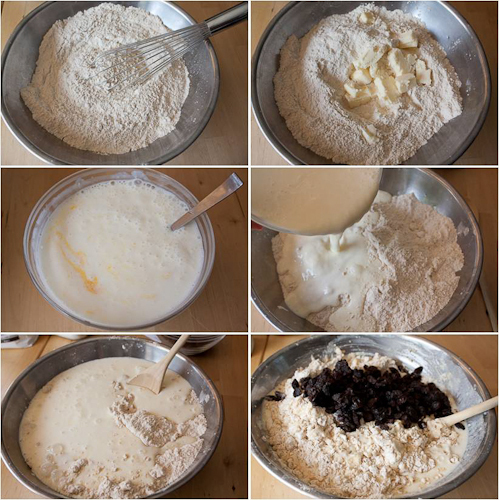 Note: Unlike the picture shown above, where I mixed in the raisins and fennel seeds after adding the buttermilk, next time I would actually add them prior to the wet ingredients so that they are well dispersed throughout the dough. 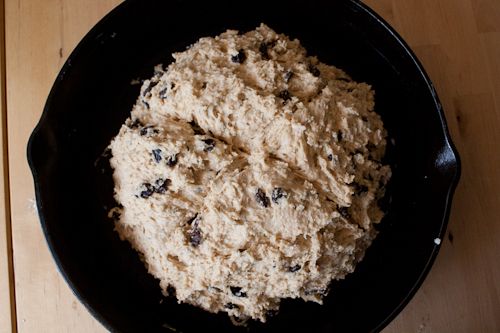 When you're mixing the dough together, mix just until everything is incorporated. Be careful to not over mix (the dough should not be kneaded). Like the secret to a good, fluffy, light biscuit or scone, the trick is to handle the dough as little as possible. When the dough has come together, turn it into your buttered cast iron skillet or Dutch oven, and slash a cross into the top. Old folklores say that the cross cut on the top of Irish Soda Bread is to ward off evil and "let the devil out" while it's baking, or let the fairies out (for a less fire and brimstone version). Practically though, slashing the top of the bread allows the heat to penetrate the thickest part of the loaf, helps the bread rise better, and also serves as a guideline for breaking the bread evenly once it's done. Summary: This recipe results in a soda bread that is dense, yet moist, with a golden crunchy crust. The bread is buttery and sweet, with plump, chewy raisins generously scattered throughout, and laced with a hint of licorice from the fennel seeds. Also, the resulting loaf is huge. You could easily cut the dough in half and form two nice-sized loaves, great for gift-giving. This recipe was written in from Patrice Bedrosian of Brewster, New York. Patrice lost her stepbrother, Jerry O'Leary, in 9/11 and cited this as a recipe that she turned to in the days following the tragedy, to bring comfort and ease to her home. The recipe was one that she received from Jerry's mother. I think that it is a heartfelt example of the power of food in bringing people together, honoring our past, and passing along the comfort that only something made with love can bring. Preheat oven to 350°F. Generously butter heavy ovenproof 10- to 12-inch-diameter skillet. You can also use a dutch oven. In large bowl, whisk together both flours, sugar, baking powder, salt, and baking soda. Add butter; using fingertips to incorporate until the mixture is the consistency of corn meal. Stir in raisins and fennel seeds. Whisk buttermilk and egg in medium bowl to blend and add to dough. Stir just until well incorporated. Dough will be very sticky; I just use my hands. Be careful not to over mix or else the bread will become too dense. Transfer dough to prepared skillet; smooth top, mounding slightly in center. Using small sharp knife dipped into flour, cut 1-inch-deep "X" in top center of dough. Bake until bread is cooked through and tester inserted into center comes out clean, about 1 hour 15 minutes. Cool bread in skillet 10 minutes. Turn out onto rack and cool completely. Saint Patrick, the man, the saint, the slayer of snakes -- St. Patrick is the patron saint and national apostle of Ireland who is credited with bringing Christianity to Ireland. He is said to have "driven the snakes" from Ireland. Snakes referred to the serpent symbolism of the Druids, whose pagan rites were abolished by the big P.
Why Shamrocks -- Legend has it that Saint Patrick used the three-leaved clover to explain the Holy Trinity to the pagan Irish. Soda Bread not really Irish -- Soda bread was actually invented by the American Indians, who used pearl ash (made from potash, which was made from lye, which was made from hardwood ashes).